Pilgrimage maps of Jerusalem began to appear alongside mappae mundi and Crusader maps in the 1200s CE. This example was produced by an English Benedictine monk, Matthew Paris, and depicts the journey from London to Jerusalem. 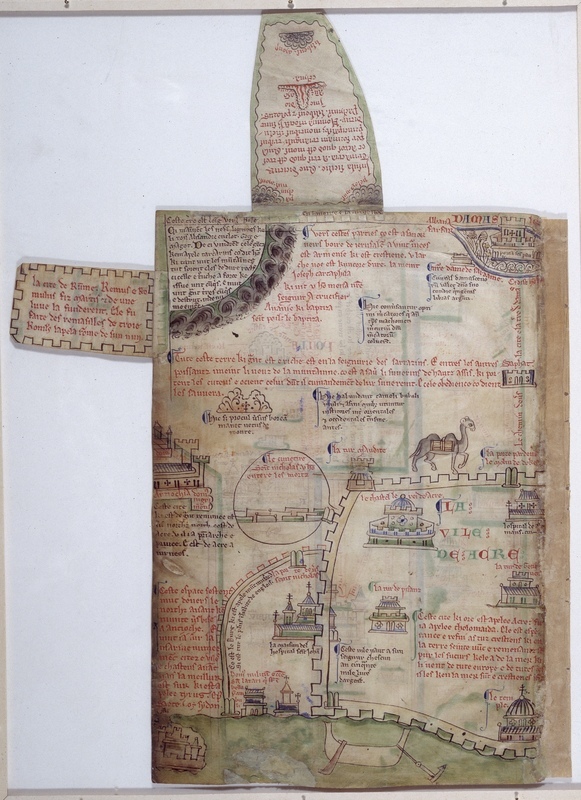 The map now appears in versions of Paris’s Chronica Maiora, his history of the world from creation to 1253 CE. It appears in a linear style, with folios pasted back to back, and may have originally have been a single long strip map. In his itinerary, Paris's Holy City is presented simultaneously as the real earthly city of his own day and as the square-walled heavenly city of the future described in the Book of Revelation. The function of the map is unknown, and has been subject to a variety of interpretations. Some understand Paris’s maps as illustrations of the historical accounts in his Chronica Majora, arguing that the images provided a political topography of the region in the wake of the first Crusades. This may have been intended to illuminate the territory for a royal English readership, as well as serving as an encouragement to reclaim the city, which had fallen into the hands of Khorezmian Turks in 1244. Others, however, argue that Paris’s map was created for his own monastic community, as an aid to a monk undertaking an imagined meditative pilgrimage to Jerusalem, the heavenly city of the future, which the monks were unable to visit in their own day.